For years Hermann Services has been fueling up at Loves Travel Stops and Country Stores and it turns out the love goes both ways. 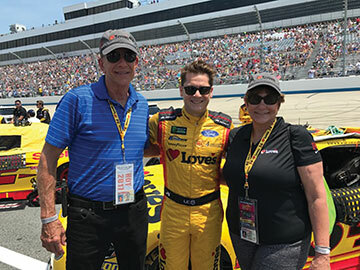 Larry Daly of Loves invited Hermann Services to attend the NASCAR race at the Dover International Speedway where its Loves Ford Fusion was racing that day. 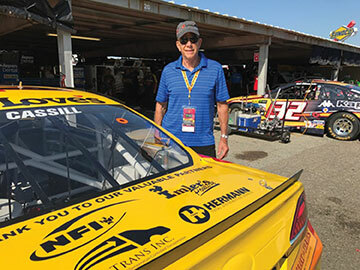 Upon seeing #34, a bright yellow race car driven by London Cassill, Dennis and Terri Hermann noticed the Hermann Services logo on the tailgate. “What an honor it was to see our company logo as a brand partner of Loves at such a prestigious event!” exclaimed Dennis Hermann, CEO and President of Hermann Services.